Protect your family's power supply by upgrading your grid-tied solar power system. With the use of a technology called Micro-grid AC Coupling, our American Independence 8800 allows you to put your solar panel array to work even when grid power is not available. 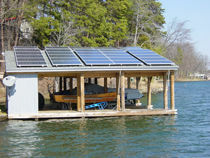 You'll now be able to enjoy the independence from power companies that comes with off-grid systems. Easy and safe to install, this Micro-grid AC Coupling Kit is designed to work with grid-tie systems up to 7,000 watts in size. It includes a Magnum MS4448PAE sinewave inverter, a remote control, battery monitor, and Fullriver AGM batteries. 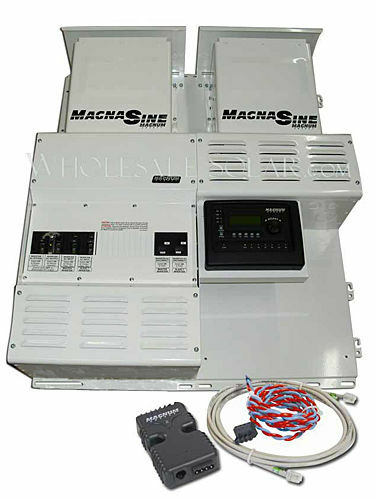 This system is a simple, pre-wired solution for adding battery backup to most grid-tied inverters. The battery bank and battery-based inverter are sized to accomodate grid-tied solar arrays up to 7,000 watts (STC) in power. Feel free to call us if you need help picking a battery backup solution for your system. later added the American Independence. How does Micro-grid AC Coupling in this system work? The Magnum Energy inverter is on "standby" until the utility company goes down. With any interruption in the grid power, the Magnum inverter comes alive to create a local grid inside your home or building. Your gridtie inverter will continue to operate with full output to allow normal operation of your critical loads. When grid power returns and stabilizes for 5 minutes, the Magnum inverter defaults back to the grid to keep your critical loads running. Meanwhile, the gridtied solar panels never know the difference.